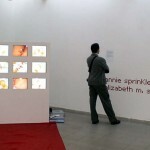 Extreme Kiss Installation, in the Digital Love exhibit at the M'ARS Centre of Contemporary Art in Moscow, Russia. This project is one of our Kiss Works series. A grid of nine monitors play three different angles (close-up, head and shoulders, and overhead) of us kissing for the length of a one hour video tape. We are both bald. We kiss very intensely and passionately in public space, at a gallery or museum opening, for three or four hours without stopping, and without going further than the kiss. People can watch us or not. Seen here is a kiss performed on Thursday, May 19th, 2005 during the opening night of the art exhibit, Private vs. Public (curated by Tina Butcher) at Artists' Television Access Gallery in San Francisco.